The increased role of IT in the healthcare sector has led to the coining of a new phrase "health informatics," which deals with the use of IT for better healthcare services. Health informatics applications often involve maintaining the health records of individuals, in digital form, which is referred to as an Electronic Health Record (EHR). Building and implementing an EHR infrastructure requires an understanding of healthcare standards, coding systems, and frameworks. This book provides an overview of different health informatics resources and artifacts that underlie the design and development of interoperable healthcare systems and applications. 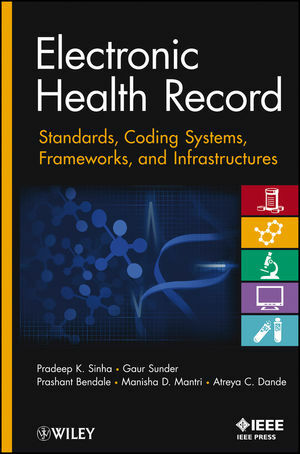 Electronic Health Record: Standards, Coding Systems, Frameworks, and Infrastructures compiles, for the first time, study and analysis results that EHR professionals previously had to gather from multiple sources. It benefits readers by giving them an understanding of what roles a particular healthcare standard, code, or framework plays in EHR design and overall IT-enabled healthcare services along with the issues involved. PRADEEP K. SINHA, PhD, is the Senior Director (High Performance Computing) at the Centre for Develop- ment of Advanced Computing (C-DAC), India, and coordinator and mentor to several high-technology R&D groups there. GAUR SUNDER heads research and development at Medical Informatics Group (MIG) at C-DAC, India, and is a member of the eHealth Committee of the Bureau of Indian Standards and the National EHR Standards Committee of the Union Health Ministry of India. PRASHANT BENDALE is involved in the research and development of the distribution and integration model for building EHR stores at C-DAC. MANISHA D. MANTRI is involved in the research and development of an evolving EHR model, compliance to eHealth standards, and security policies for EHR systems at C-DAC. ATREYA C. DANDE is involved in the research and development of EHR standards, national EHR frameworks, distributed technologies, and optimal search algorithms in healthcare at C-DAC.